Councillor Sandy Aitchison in the public park. Irresponsible dog owners are being accused of using darker evenings to their advantage by leaving behind their pets’ dirt in public places. Galashiels councillor Sandy Aitchison believes there has been an increase in the amount of dog dirt left on pavements of late, describing the behaviour of the owners responsible as “dreadful”. 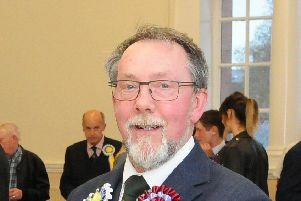 “Despite the police’s community action team having that as one of their briefs, it really is a challenge,” Mr Aitchison told this month’s meeting of Galashiels Community Council. “It reflects on our society that people are willing to have the enjoyment of having a dog but not the responsibility of tidying up after them. “Obviously, in the darker nights during this time of year, the amount of dog’s dirt being left on pavements is increasing. “People are going out with their dog, are obviously having a quick look around in the dark and if nobody is watching, they are just leaving the dirt lying.